Hey, readers, welcome to my very first companion review of a movie based on a banned book. I’ll be doing these from time to time, when I review a book that has a movie adaptation. Today’s repeat offender is The Hunger Games. Remember, this is a blog about intellectual freedom and controversial ideas. I’m not telling you what to think about the movie. I’m telling you what I think. Agree? Disagree? Tell me what you thought of the movie or the controversy surrounding it. I’m pretty sure that penguin is preparing to kill me. He wins the Hunger Games. Hey everyone! 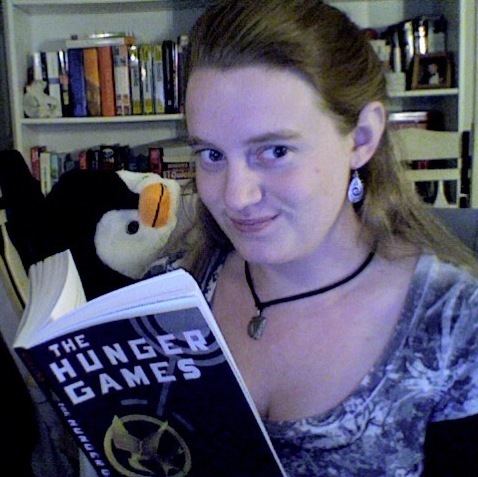 So, in honor of Thanksgiving and Black Friday, I’m reviewing The Hunger Games because irony. This review will not be of the whole series, as the Scary Stories and Goosebumps reviews were, but solely of the first book. A separate review of the movie will follow. THE VERDICT: The story of The Girl Who Was On Fire has certainly come under its share of fire, placing itself on the ALA’s Top 10 Frequently Challenged Books list for two consecutive years. Though Halloween is over, a lesser-known horror-related occasion is fast approaching. November 8th is the birthday of the man who wrote vampires before it was cool, Bram Stoker. Today would be the Dracula author’s 165th birthday, so I thought I would take the opportunity to discuss censorship’s particular obsession with the horror genre. Though Stoker died a hundred years ago, his work is no less relevant and no less inflammatory. Namaste, readers. I hope all of my East Coast readers are okay tonight. Between the low temperatures and the incoming Nor’easter, my thoughts are with those of you who are still without power. We are Americans, though, and we will get through this the only way we can: together. I tip my hat to all of the volunteers out there and everyone who has donated or taken in evacuees. You are all heroes.